QuickTextPaste works with the clipboard, select (activate, enable) Restore the clipboard feature is very useful! For example, if already the text is in the clipboard , QuickTextPaste will restored this, so that you can continue to use this text! Please use .... the latest Version of QuickTextPaste. (Image-1) Restore the text in clipboard! This screenshot has been snipped under Windows 10, however, you can use this restore the clipboard example as a solution to restore the clipboard without hesitation also for earlier Microsoft's Windows operating systems whether you use the Quick Text Paste Tool on private Windows desktop Computer, to go on tablet-PC, Surface Pro / Go, or even on a professional server operating system in you commercial office. It has been tested on all and successfully verified. It is a simple keep and restore the clipboard feature, use it and get in touch with the clipboard paste benefits! 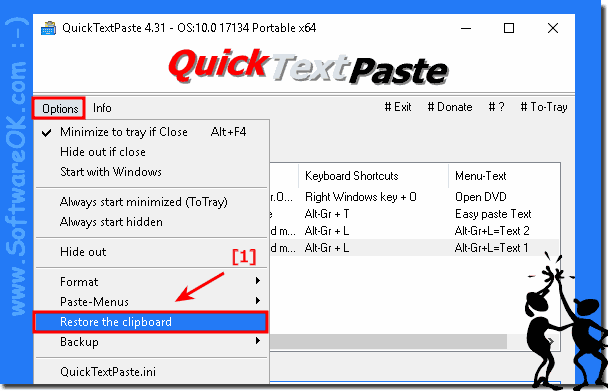 QuickTextPaste - FAQ-7: What does restore the clipboard in QTP for Windows?